We generally rely on roving correspondent Jeff Porten to ferret out interesting products at the unimaginably large CES trade show. But there was one topic I followed closely from afar: home automation, and specifically, products compatible with Apple’s HomeKit ecosystem. If you’re dabbling with installing HomeKit switches and sensors in your house this year, here are the new products you’ll want to check out. Belkin Wemo — The first big HomeKit announcement out of CES was that Belkin finally launched HomeKit support for its popular line of Wemo devices — something the company had first announced in May 2017 (see “Belkin Adding HomeKit Support to Wemo,” 18 May 2017). That’s the good news. 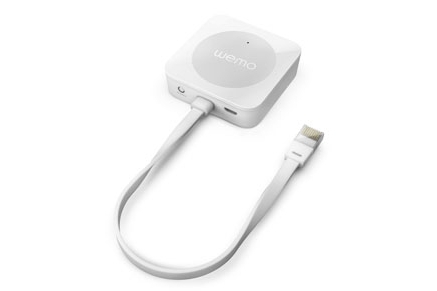 The bad news is that enabling HomeKit support requires you to buy a $40 Wemo Bridge and plug it into your router, and it’s sold out until next month. Also, early reviews indicate that it doesn’t support Wemo light bulbs, which were discontinued last year. Despite those caveats, this move is a big deal because Belkin Wemo is to smart outlets what Philips Hue is to smart bulbs: one of the first user-friendly models on the market and the recipient of tremendous ecosystem support. Some variant of the Wemo outlet has been the Wirecutter’s top pick for smart outlet for years, and if you already have several Wemo outlets, the Wemo Bridge is easily worth $40. But for those who haven’t already invested in the Wemo ecosystem, it’s worth holding off to see if future Wemo models support HomeKit without the bridge. Based on comments, feedback and ideas from Philips Hue users, the redesign will enhance both existing and new features, to help consumers light their home smarter with even more ease. The new app will improve daily use, and ensure seamless setup and integration of Hue accessories and new Philips Hue Entertainment partnership integrations. The interface will also enable consumers to instantly access their last used scenes and to simply group lights and select their desired color temperature or color. I just hope it improves HomeKit sync so that the Hue app stops overwriting my accessory and scene names! But wait, what’s this Philips Hue Entertainment bit mentioned? Many Hue-compatible apps, such as Light DJ, let you sync audio and video with Hue lights. Philips is incorporating such syncing directly into its ecosystem, starting with a new app, Hue Sync, for Windows and Mac. Hue Sync is due later this year and will let you sync your lights to any game, movie, or song played on your computer. Philips will also be partnering with companies to integrate light syncing directly into other products. First up will be gaming-focused PC hardware maker Razer. Check out the video to get a sense of what Razer plans to do with Hue Entertainment. More practically, Philips is finally releasing outdoor Hue lights, due in mid-2018. Outdoor lights have been high on my wishlist since I first starting using Hue bulbs, so I’ll be curious about pricing. Elgato Eve — Elgato has long been one of HomeKit’s biggest boosters, and the company shows no signs of slowing down, having announced two products at CES: a redesigned Eve Room (see “A Prairie HomeKit Companion: The Elgato Eve Room,” 19 June 2017) and a new product called the Eve Button, which acts as a HomeKit remote. The Eve Room and Eve Button share the same chassis as last year’s Eve Degree. That’s clever, but you’d be forgiven for trying to turn your lights off with your thermometer. The original Eve Room was a white plastic box that tracked air quality, temperature, and humidity. The new one has the same capabilities, but it now features a built-in rechargeable battery and an E-Ink display that shows those things so you don’t have to look at your phone. When it ships in March 2018, it’ll set you back $99.95, $20 more than the current model. If that’s a bit much for you, the Eve Degree, which trades the air quality sensor for an air pressure sensor, is available on Amazon for only $61. The Eve Button is a portable HomeKit remote that works independently of an iOS device. You can assign three HomeKit scenes to it: one tied to a single press, another to a long press, and third to a double press. I haven’t been terribly impressed with similar devices from other manufacturers, so I’ll be curious to see how well the Eve Button works. It’s available now from the Elgato Store for $49.95. iDevices and Brilliant — Smart switches have been around for a while — I have an Eve Light Switch installed in my TV room — but manufacturers are starting to realize that a hardwired smart home controller could be used for more than merely flipping one set of lights on and off. At CES, iDevices announced two smart in-wall switches: the Ceiling Fan Switch and the Instinct. The Ceiling Fan Switch is a HomeKit-compatible switch that has additional buttons to control most ceiling fans. The Instinct is seemingly identical, except that it has support for Amazon Alexa built in so you can use your voice to control your fan. iDevices couldn’t provide pricing or availability yet. More ambitious (and likely more expensive) is the Brilliant Control, due sometime in 2018. It features a touchscreen, various sensors, and support for Amazon Alexa. 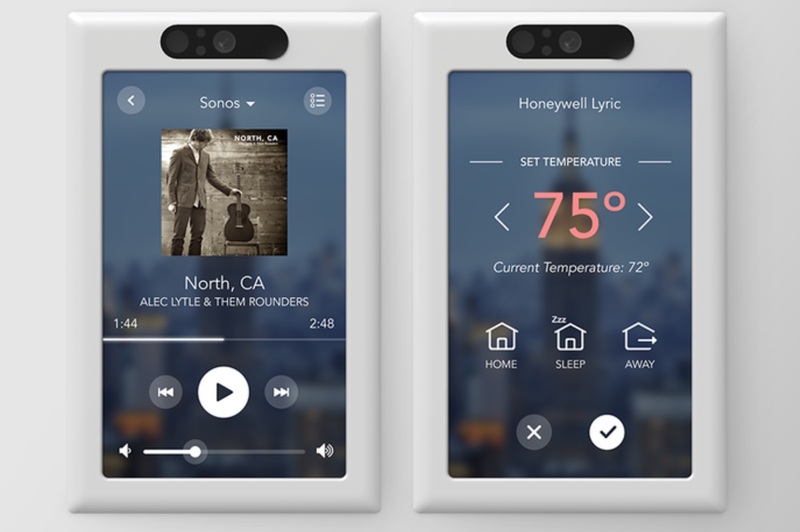 It claims to work with Bose, Ecobee, Honeywell, Nest, SmartThings, Sonos, and others, but unfortunately will not work with HomeKit, at least initially. But despite that, the concept is pretty dang cool. 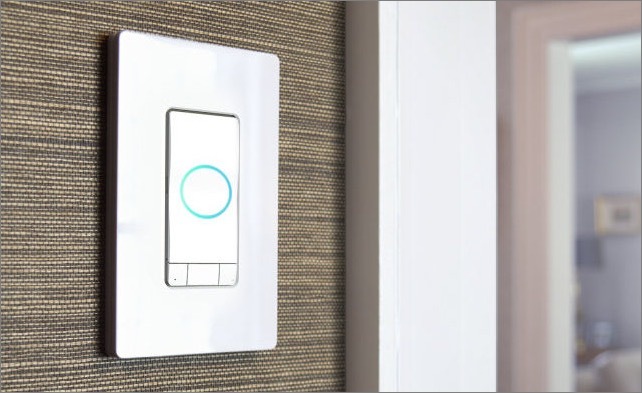 Light switches are fairly easy to install, and it’s genius to replace one with a gizmo that can control lights, thermostat, audio, and more. The Brilliant Control will cost between $200 and $350 when it ships. “Is Your House on Fire, Alexa?” — Ever say to yourself, “Man, I wish I could talk to my smoke detector!” No? OK, have you ever wished your smoke detector could play music? No? Silly sounding, I know, but it’s easier than embedding speakers in your ceiling. The Onelink Safe & Sound smoke and carbon monoxide detector can do both those things, it supports HomeKit, it has Amazon Alexa built in, and it will support AirPlay 2 whenever that ships. Even though it’s a whopping $249.99, I want one — if nothing else, to mirror the Alexa-powered Ecobee4 on the other side of my kitchen. Apparently I’m not alone: it’s already on backorder and isn’t expected to be back in stock in March 2018. 9to5Mac has a neat video of it. Abode — HomeKit works with security systems, but we haven’t seen much support yet (see “A Prairie HomeKit Companion: HomeKit Security Provides Peace of Mind,” 11 September 2017). That will improve when Abode ships the Iota all-in-one security system in late Q1 2018. In truth, the Iota looks like a glorified indoor security camera, but it does feature battery and cellular backups. If you’re looking for an inexpensive solution and don’t need HomeKit compatibility, check out the Wyzecam, which I hope to review for TidBITS soon. 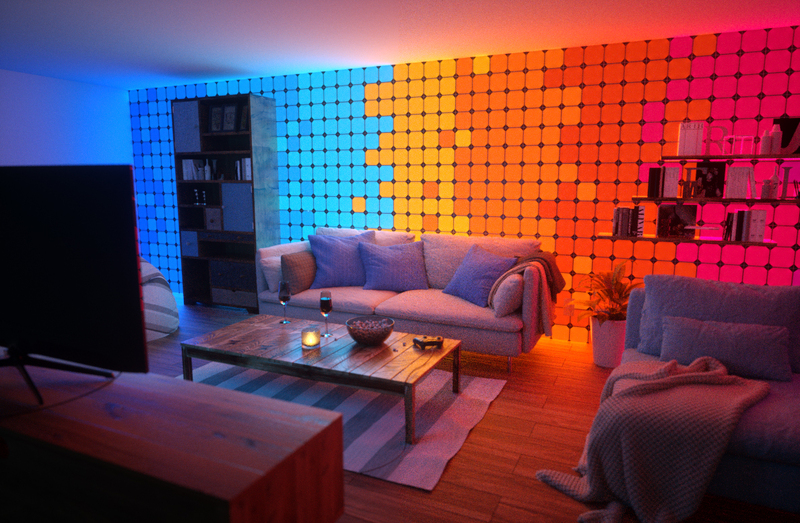 Nanoleaf — In the HomeKit space, no company has the boldness or panache of Nanoleaf. They make multi-colored triangular light panels that go on your wall. Why? Because it’s trippy and it’s the future, man. Don’t you ever watch any movies? Here, watch this one to see what it’s about. Is that not cool and futuristic enough for you? How about the Nanoleaf Rhythm Edition, which makes the light panels flash in tune with music? Check out its video. In case futuristic touch, motion, and sound sensitive light panels weren’t out there enough for you, there’s the upcoming Nanoleaf Remote, which is a decahedron-shaped remote for the Nanoleaf panels (think of a ten-sided dice from Dungeons and Dragons). You rotate it and smack it on the ground to control your panels, and from the video, it looks like you can control other HomeKit devices with it. Even though Apple has taken steps to make HomeKit more accessible to device makers (see “A Prairie HomeKit Companion: What’s Coming in iOS 11,” 7 July 2017), we’re still seeing reputable vendors reject HomeKit support due to expense. I appreciate that Apple has rigorous standards and filters out junk vendors, but I worry that they’re hampering HomeKit adoption too much. Unfortunately, even Apple’s protocols aren’t enough to prevent security vulnerabilities (see “HomeKit Vulnerability Discovered, Already Patched,” 8 December 2017). Alexa was arguably the “winner” of CES 2018, and it seems like every smart home vendor is racing to put it in their products. If Apple had been more open and inviting, Siri could have been in that position. The Ecobee4 includes Alexa, and I don’t find it any better at recognizing my words than Siri. But Alexa does provide more integration with other apps and services, thanks in large part to Amazon’s willingness to license it to third parties. At this rate, by the time Apple ships the HomePod, Alexa will be in your speakers, TV, thermostat, and smoke detector. I’m leery of these always-listening AI assistants, but if I’m going to be stuck with one, I’d much rather it be Apple’s, given the company’s superior privacy record. But Amazon may already have too much momentum with Alexa for the HomePod and Siri to compete. I hope these two issues don’t render HomeKit an also-ran in the home automation space because I truly believe that it’s the superior ecosystem. I’ve experimented with both Amazon’s and Google’s solutions and have found them lacking, mostly in the interface department. I’ve been on the HomeKit bandwagon since the announcement but am concerned that the weak point of HomeKit besides lack of support, is Siri. I’ve been a voice interface fan since Apple purchased the tech but Google assistant clearly is superior and with their AI lead, Google is the one to watch over the next year or so. Amazon is winning the voice assistant race now but I believe Google and Samsung should have a strong year. Apple however continues to fall behind in AI, voice assistants and smart home products. I hope Apple has some surprises but lately the surprises have been in the negative side. Agree with Google, not Samsung. Samsung is even more behind than Apple. I replaced my WeMo switch with an Elgato Eve Energy when Belkin at the time said they wouldn't update it for Homekit support. I didn't like Belkin's proprietary software.